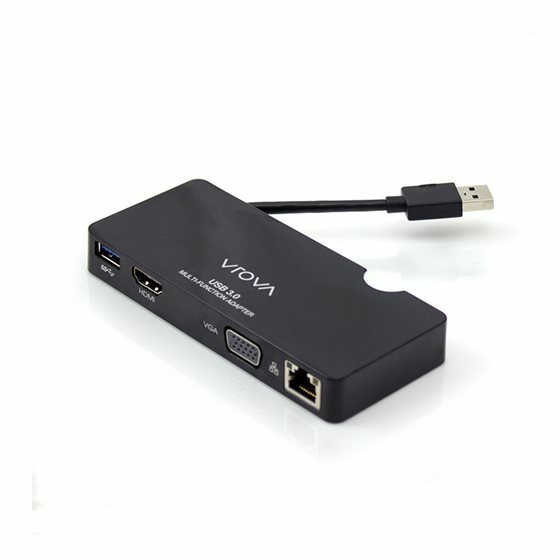 * The VROVA (VU3UDP) USB 3.0 Universal Multi Function Adapter USB to HDMI or VGA/Ethernet & USB 3.0 is a compact all in one solution for connecting your computer/laptop to an external display gigabit ethernet and USB peripherals all at the same time. * With no need for any external power it's a perfect travel companion and can replace as many as three adapters/dongles to save you space on your desk and in your bag. * The adapter lets you connect to a wired networks via an Ethernet port ensuring connectivity in virtually any environment. * When connected to both the HDMI and VGA monitors the docking station will automatically switch to the HDMI monitor and disable the VGA monitor.